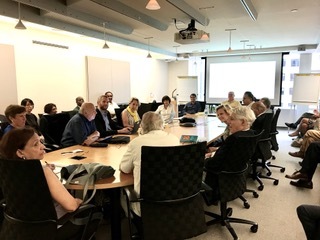 On July 5, the 1818 Society hosted a discussion on the World Bank’s anti-corruption policies, lessons learned since the 1996 “Cancer of Corruption” speech, and programmatic plans going forward. The event featured Joel Turkewitz, Lead Public Sector Specialist at the World Bank, and was chaired by Richard Stern, President of the Partnership for Transparency. Several PTF Advisers joined the panel to discuss their thoughts on what the anti-corruption community has learned thus far and how to apply it in the future. Turkewitz’s presentation centered around examining the history of World Bank anti-corruption programs with questions such as what the Bank’s priorities should be going forward, how the Bank can be most effective with its resources, and what results can be expected. To this end, Turkewitz conducted an inventory analysis of Bank activities on corruption from 1997-2016 to determine what commitments already existed, to what extent they achieved their goals, and how the nature of corruption has changed. The analysis concluded that there is an apparent lack of association between actions taken to fight corruption, such as enacting laws and regulations, and impact. Lessons learned from the inventory were the need to consider the different varieties of corruption, to understand nuances of environment, and to understand the results possible at the project and country level. Furthermore, a notable trend discovered from 1997-2016 was the decline of training activities and the increase in non-lending technical assistance. The next steps Turkewitz outlined are to map corruption work relative to indicators such as extreme poverty and level of competitiveness and determine if there is any overlap. PTF Adviser Barbara Kafka’s ensuing discussion centered around the involvement of civil society in the fight against corruption, highlighting to need to focus on both the supply side and the demand side in creating more buy-in, which she noted the Bank has neglected. Kafka emphasized the necessity of building collaborative relationships between CSO’s and the government and having a sound feedback loop to enhance sustainability. While civil society lacks capacity, resources, and expertise, with sustained support there can be positive outcomes. Pietronella van den Oever, PTF Adviser, brought a similar perspective and reiterated the need to engage civil society in order to have observable and measurable effects. To this end, she remarked that PTF stands out for having sustained contact with its CSOs and having observable measures being adopted at the local level translating to adoptions at the regional and national level. The meeting concluded with comments from Richard Stern and other participants at the meeting. Turkewitz ended the meeting by outlining further possibilities for approaching corruption such as e-procurement, changing incentives around oversight, and focusing on free press.